October 29, 2007, 9:00a.m. - 12:30p.m. Mary Jo Nye's research interests include the history of chemistry and physics since the eighteenth century in western Europe and the United States; the social and cultural history of science, including laboratory science, university education, and the political activities of scientists; and the philosophy of science, especially relations between theory and evidence. Professor Nye completed her undergraduate studies at Vanderbilt University and the University of Wisconsin, taking her Ph.D. in History of Science at the University of Wisconsin. From 1970 she taught at the University of Oklahoma, where she was named George Lynn Cross Research Professor in the History of Science in 1991. She was appointed a Thomas Hart and Mary Jones Horning Professor of the Humanities and Professor of History at OSU in 1994. Visiting appointments have included the University of Pittsburgh, the Institute for Advanced Study in Princeton, Harvard University, and Rutgers University. She has been a By-Fellow at Churchill College at the University of Cambridge and a Visiting Scholar at the Max Planck Institut fur Wissenschaftsgeschichte in Berlin. Professor Nye was the 1999 recipient of the Dexter Award for Outstanding Achievement in the History of Chemistry, given by the Division of the History of Chemistry of the American Chemical Society. She is a Fellow of the American Academy of Arts and Sciences, a Fellow of the American Association for the Advancement of Science, and a Corresponding Member of the Académie Internationale d'Histoire des Sciences. Michael D. Gordin is an Associate Professor in the History Department at Princeton University, where he teaches the history of science and Russian history. He is the author of A Well-Ordered Thing: Dmitrii Mendeleev and the Shadow of the Periodic Table (2004), and Five Days in August: How World War II Became a Nuclear War (2007). He is currently working on an international history of the development of the first Soviet nuclear bomb in 1949, and a book on the development of nationalism in Russian and German chemistry in the mid-nineteenth century." Ana Simões received her Ph.D. in 1993 from the University of Maryland in History and Philosophy of Science. She also holds a masters degree in the History of Science. Simões has been the Head of the Centre for the History of Science at the University of Lisbon since 2003, and an Assistant Professor at the University of Lisbon since 2004. Her areas of research are History of the Physical Sciences in the 19th and 20th centuries, History of Quantum Chemistry, History of Science in Portugal, and History of Science and Technology in the European Peripheries. Her most recent books include Uma biografia cientifica do Abade Correia da Serra, and Correia da Serra: Investigaçöes Botânicas. Kenneth Krane is Professor Emeritus with the Physics Department and has been with Oregon State University since 1974. He obtained both his Masters and Ph.D. in physics from Purdue University and recently received the Millikan Medal, which recognizes teachers who have made contributions to the teaching of physics, from the American Association of Physics Teachers in 2004. His current research pursuits involve nuclear structure determinations by means of neutron capture, radioactive decay, and gamma ray angular correlation studies. October 29, 2007, 2:00p.m. - 5:30p.m. Clifford Mead is Emeritus Head of the Oregon State University Libraries Special Collections, a position that he held from 1987 to 2010, beginning with the first arrival of the Ava Helen and Linus Pauling Papers to the university. Previously, Mr. Mead served as Rare Books Librarian in charge of Special Collections and also as Acting Director at Mason Library, Keene State College, New Hampshire. He holds a Master of Library Science (1978) from Syracuse University. Mr. Mead has authored several publications, including Thomas Pynchon: A Bibliography of Primary and Secondary Sources (1989). 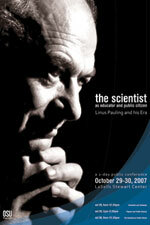 He has co-edited The Pauling Symposium: A Discourse on the Art of Biography (1996) and Linus Pauling: Scientist and Peacemaker (2001). His most recent book, co-edited with Chris Petersen, is The Pauling Catalogue: Ava Helen and Linus Pauling Papers at Oregon State University (2006). Bassam Z. Shakhashiri is professor of chemistry at the University of Wisconsin-Madison and the first holder of the William T. Evjue Distinguished Chair for the Wisconsin Idea. He is well known internationally for his effective leadership in promoting excellence in science education at all levels and for his development and use of demonstrations in the teaching of chemistry in classrooms as well as in less formal settings such as museums, convention centers, shopping malls and retirement homes. The Encyclopedia Britannica cites him as the “dean of lecture demonstrators in America.” His scholarly publications, including the multi-volume series, Chemical Demonstrations: A Handbook for Teachers of Chemistry, are models of learning and instruction that have been translated into several languages. Professor Shakhashiri has given over 1100 invited lectures and presentations in the North America, Europe, Asia, Australia, the Middle East, and South America. He is probably best known to the public at large in the USA for his annual program, “Once upon a Christmas Cheery in the Lab of Shakhashiri,” which has been seen on PBS and on cable television stations throughout the country. This science-oriented entertainment has played to packed houses at such varied locations as the University of Wisconsin-Madison, the National Academy of Sciences and the Smithsonian's National Air and Space Museum in Washington, and the halls of the U.S. Congress. Professor Shakhashiri has been featured in newspapers, magazines, national and local radio and television, including the New York Times, the Washington Post, Newsweek, Time, the German-language Business Week, NBC Nightly News, National Public Radio, CNN, and the Larry King Show. He appears as a regular guest on the Ideas Network of Wisconsin Public Radio and on WKOW-TV’s WAKE UP WISCONSIN. Professor Shakhashiri currently directs the Initiative for Science Literacy and its various programs including Science in the City, SCIENCE IS FUN! public presentations, the SCIENCE IS FUN web site http://www.scifun.org, Science, the Arts, and the Humanities, Women in Science, and the Conversations in Science Series. Professor Shakhashiri is the recipient of over 35 awards, including the 2002 American Association for the Advancement of Science Award for Public Understanding of Science and Technology. In 2004 he was inducted into the Hall of Fame of the national chemistry fraternity Alpha Chi Sigma. In 2005 he received the Madison Metropolitan School District “Distinguished Service Award for Citizen”, was elected Fellow of the Wisconsin Academy of Sciences, Arts and Letters, received the CHEMICAL PIONEER Award from the American Institute of Chemists, the American Chemical Society Helen M. Free Award for Public Outreach for "lifelong accomplishments and for explaining and demonstrating science with charisma and passion", and was cited in the Answer Book of Capital Newspapers as “the coolest UW professor.” In 2007 he received the National Science Board Public Service Award. He is the recipient of six honorary doctoral degrees. Robert Anderson attended St John’s College, University of Oxford, supported by a Casberd Exhibition and a State Scholarship. He received a B.A. in chemistry in 1966, followed by a B.Sc. (electrical conduction in free radical solutions) and a D.Phil. (inelastic scattering of neutrons from adsorbed molecules), in 1970. He then moved to his first job as a curator at the Royal Scottish Museum, Edinburgh, where he had responsibility for the historical chemistry and physics collections. Edinburgh was a great centre for chemistry in the 18th and 19th centuries and the collection at the museum included the chemical apparatus connected with the research and teaching of Joseph Black (1728–1799), who had identified carbon dioxide and latent heat. In 1975 he moved to the Science Museum, London, where he joined the Chemistry Department, and shortly afterwards was assigned the task of moving and displaying the Wellcome Museum of the History of Medicine. Upon completion, he returned to chemistry as head of the department. In 1976 he mounted an exhibition and organized a conference to celebrate the 250th Anniversary of the Medical Faculty, the papers of which he edited as The Early Years of the Edinburgh Medical School. In 1978 Anderson published a catalogue of this remarkable collection: The Playfair Collection and the Teaching of Chemistry at the University of Edinburgh 1713-1858. Stephen Lyons is an award-winning writer and producer with 25 years of experience in television, newspapers and magazines. He has written grant proposals and film treatments that have helped raise more than $25 million for a dozen PBS series and specials. And he has been a writer and producer on three documentaries for the long-running PBS science series NOVA, as well as on shorter pieces for other programs. After four years as Senior Editor for Program Development at the WGBH Science Unit, Lyons left to form Moreno/Lyons Productions with his wife Aida Moreno, another longtime WGBH producer. He served as project director for NOVA's Percy Julian Biography Project, a five-year effort to call attention to the life and career of the late African American chemist Percy Julian. The project, funded with major grants from the National Science Foundation, the National Endowment for the Humanities and the Alfred P. Sloan Foundation, culminated in a two-hour biography of Julian, written and produced by Lyons and director Llew Smith, and starring Tony Award-winner Ruben Santiago-Hudson as Julian. "Forgotten Genius" was broadcast on NOVA in February 2007. Lyons is currently developing a multimedia chemistry project called The Mystery of Matter with support from the Chemical Heritage Foundation and the Camille and Henry Dreyfus Foundation. Dudley Herschbach received his B.S. degree in Mathematics (1954) and M.S. in Chemistry (1955) at Stanford University, followed by an A.M. degree in Physics (1956) and Ph.D. in Chemical Physics (1958) at Harvard. After a term as Junior Fellow in the Society of Fellows at Harvard (1957-1959), he was a member of the Chemical Faculty at the University of California, Berkeley (1959-1963), before returning to Harvard as Professor of Chemistry (1963), where he is now Baird Professor of Science (since 1976). He has served as Chairman of the Chemical Physics program (1964-1977) and the Chemistry Department (1977-1980), and Co-Master with his wife Georgene of Currier House (1981-1986). His teaching includes graduate courses in quantum mechanics, chemical kinetics, molecular spectroscopy, and collision theory, as well as undergraduate courses in physical chemistry and general chemistry for freshmen, his most challenging assignment. He is engaged in several efforts to improve K-12 science education and public understanding of science. He serves as Chair of the Board of Trustees of Science Service, which publishes Science News and conducts the Intel Science Talent Search and the Intel International Science and Engineering Fair. He is a Fellow of the American Academy of Arts and Sciences, the National Academy of Sciences, the American Philosophical Society, and the Royal Chemical Society of Great Britain. His awards include the Pure Chemistry Prize of the American Chemical Society (1965), the Linus Pauling Medal (1978), the Michael Polanyi Medal (1981), the Irving Langmuir Prize of the American Physical Society (1983), the Nobel Prize in Chemistry (1986), jointly with Yuan T. Lee and John C. Polanyi, the National Medal of Science (1991), the Jaroslav Heyrovsky Medal (1992), the Sierra Nevada Distinguished Chemist Award (1993), the Kosolapoff Award of the ACS (1994), the William Walker Prize (1994); and named by Chemical Engineering News among 75 leading contributors to the chemical enterprise in the past 75 years (1998), and the Council of Scientific Society President's Award for Support of Science (1999). Professor Herschbach has published over 400 papers. His current research is devoted to methods of orienting molecules for studies of collision stereodynamics, means of slowing and trapping molecules in order to examine chemistry at long de Broglie wavelengths, reactions in catalytic supersonic expansions, and a dimensional scaling approach to strongly correlated many-particle interactions, in electronic structure and Bose-Einstein condensates. October 30, 2007, 9:00a.m. - 12:30p.m. Chris Petersen, Faculty Research Assistant in the OSU Libraries Special Collections, has worked with the Ava Helen and Linus Pauling Papers for over a decade, contributing to numerous arrangement, description, preservation and digitization projects, including the department's award-winning series of Documentary History websites devoted to special topics in the lives and work of Linus and Ava Helen Pauling. With Cliff Mead, he is the editor of The Pauling Catalogue (2006), a six-volume, 1,800-page reference work, featuring over 1,100 illustrations and providing detailed description of the massive Pauling archive. Biographer and science writer Thomas Hager has written or edited five books on medicine and science. After earning master's degrees in both medical microbiology/immunology and journalism, his professional career began with a communications internship at the National Cancer Institute. He then worked as a freelance medical writer, a regular contributor to American Health, and West Coast news correspondent for the Journal of the American Medical Association. In 1983 he became founding editor of LC Magazine, a trade publication for scientists. For ten years he edited Oregon Quarterly, the magazine of the University of Oregon. More than 100 of his articles have been published in periodicals ranging from Reader's Digest, the Wall St. Journal, and Self to American Health, Cardio and the Medical Tribune. For six years he served as Director of Communications and Marketing for the University of Oregon, and spent two years directing the University of Oregon Press. Hager’s books include Aging Well (with Lauren Kessler, Fireside Press, 1990); Force of Nature: The Life of Linus Pauling (Simon & Schuster 1995); Linus Pauling and the Chemistry of Life (Oxford University Press 1998); Linus Pauling: Scientist and Peacemaker (ed. with Clifford Mead, OSU Press, 2001); and The Demon Under the Microscope (Harmony Books, 2006; paperback 2007). Lawrence Badash (1934-2010) received a B.S. in physics from Rensselaer Polytechnic Institute in 1956, and a Ph.D. in history of science from Yale University in 1964. He retired as Professor Emeritus of History of Science at the University of California, Santa Barbara, where he taught for thirty-six years. He had been a NATO Postdoctoral Science Fellow at Cambridge University, a Guggenheim Fellow, Visiting Professor of International Studies at Meiji Gakuin University in Yokohama, Director of the University of California Institute on Global Conflict and Cooperation's Summer Seminar on Global Security and Arms Control, a lecturer on the nuclear arms race at the Inter-University Center of Postgraduate Studies in Dubrovnik, Croatia, a Council member of the History of Science Society, a Member-at-Large of the Section on History and Philosophy of Science of the American Association for the Advancement of Science, and a member of the Executive Committee of the Forum on Physics and Society of the American Physical Society. Badash was a Fellow of the American Physical Society and of the American Association for the Advancement of Science. His research centered on the physical sciences of the past century, especially the development of radioactivity and nuclear physics; on the role of scientists in the nuclear arms race; and on the interaction of science and society. Badash authored or edited six books, including Radioactivity in America, Kapitza, Rutherford and the Kremlin, Scientists and the Development of Nuclear Weapons, and Reminiscences of Los Alamos 1943-1945. He final project was a book on the science and politics of the nuclear winter phenomenon. Warren M. Washington is a senior scientist and head of the Climate Change Research Section in the Climate and Global Dynamics Division at the National Center for Atmospheric Research (NCAR). Washington earned a bachelor's degree in physics and a master's degree in meteorology from Oregon State University. He received his doctorate in meteorology at Pennsylvania State University. Washington's areas of expertise are atmospheric science and climate research, and he specializes in computer modeling of the earth's climate. His book An Introduction to Three-Dimensional Climate Modeling, co-authored with Claire Parkinson (NASA), is a reference on climate modeling. Washington is consultant and advisor to a number of government officials and committees on climate-system modeling. From 1978 to 1984, he served on the President's National Advisory Committee on Oceans and Atmosphere. Washington held the office of President of the American Meteorological Society (AMS) in 1994. In May of 1995, he was appointed by President Clinton to a six-year term on the National Science Board, which has the oversight of the National Science Foundation and advises the Executive Branch and Congress on science related matters. In March 2000, he was nominated by President Clinton for a second six-year term and was confirmed by the Senate in September 2000. The National Science Board elected Washington as its Chair in 2002. He was re-elected as Chair to a second term (2004-2006). He is a Distinguished Alumnus of Pennsylvania State University and Oregon State University. He is member of the National Academy of Engineering (NAE) and the American Philosophical Society. In August 2004 Washington received the Vollum Award for Distinguished Accomplishment in Science and Technology from Reed College in Portland, Oregon. In January 2006 Washington was awarded Honorary Membership to the American Meteorological Society, which is its highest honor. In June 2006, he was the commencement speaker at Oregon State University where he received an honorary doctorate. In 2010 he received the National Medal of Science. Jane Lubchenco is an environmental scientist and marine ecologist who is actively engaged in teaching, research, synthesis and communication of scientific knowledge. She graduated from Colorado College, received her Ph.D. from Harvard University in marine ecology, taught at Harvard for two years, and has been on the faculty at Oregon State University since 1978. Jane actively promotes science and communicates scientific knowledge in international and national arenas. She is Past-President of the International Council for Science and a former President of the American Association for the Advancement of Science (AAAS) and the Ecological Society of America. She was a Presidential appointee to two terms on the National Science Board which advises the President and Congress and oversees the National Science Foundation. She often testifies before Congress, addresses the United Nations, or provides scientific advice to the White House, federal and international agencies, non-governmental organizations, religious leaders and leaders of business and industry. She co-chaired Oregon Governor Kulongoski's Advisory Group on Global Warming that recommended actions the state should take to reduce its greenhouse gas emissions. Jane founded the Aldo Leopold Leadership Program that teaches outstanding academic environmental scientists to be effective leaders and communicators of scientific information to the public, policy makers, the media and the private sector. She currently serves as Chair of the Advisory Board. She participated actively in the Millennium Ecosystem Assessment (MA), a 5-year, international scientific assessment of the consequences of environmental changes to human well-being. Among other things, she co-chaired the MA's Synthesis for Business and Industry. Jane is also a Founding Principal of COMPASS, the Communication Partnership for Science and the Sea, a collaboration among academic scientists, communication and media specialists that communicates academic marine conservation science to policy makers, the media, managers and the public. Her scientific contributions in ecology are widely recognized. Eight of her publications are "Science Citation Classics" and she is one of the "most highly cited" ecologists in the world (top 0.5%). She is an elected member of the National Academy of Sciences, the American Academy of Arts and Sciences, the American Philosophical Society, the Royal Society, and the Academy of Sciences for the Developing World. Jane has received numerous awards including a MacArthur ("genius") Fellowship, a Pew Fellowship, eight honorary degrees (including one from Princeton University), the 2002 Heinz Award in the Environment, the 2003 Nierenberg Prize for Science in the Public Interest, the 2004 Environmental Law Institute Award (the first scientist to receive this honor) and the 2005 American Association for the Advancement of Science's Award for Public Understanding of Science and Technology. In 2009 Lubchenco was confirmed as head of the National Oceanic and Atmospheric Administration.